“Mom! I’ve unlocked a whole new world!” These were the surprisingly rather astute observations of my Alex this past week as he wobbled and weaved along the pavement on his new bike, without his trusty training wheels. Hurrah! And now he’s off, riding in circles around the stretch of our road for hours. He comes back, claggy haired, stuck in sweat piles to his forehead, with a shiny beetroot red face and grazed knees to boot. On the one hand I’m thinking, thank goodness he’s off the ruddy computer games! Yet the helicopter parent in me frets about the whole new world I’m exposed to now; worry. And there she was, my baby, swerving from left to right but balanced and actually pedaling unaided. 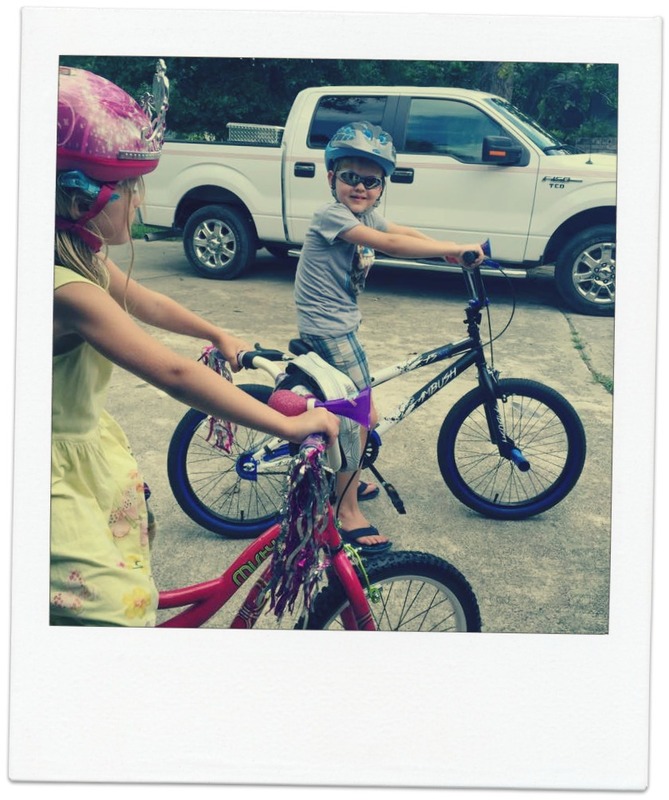 Sophie’s biking perimeters, being five, are not as far-reaching as Alex’s. She can ride in our driveway, our neighbor’s drive and about two houses down. With chaperon Alex, she can go slightly further. I’m always assured when I see them swooshing past the living room window every five or so minutes, assured that they’re keeping within mummy- given- limits. But yesterday I did the whole helicopter thing when I hadn’t seen them in about ten. I ran, barefoot, to find them and when I did, halfway up the road, chatting innocently away to their neighborhood friends, I beckoned them home with great wave-like arm gestures and a pained expression. Silly, really. Somewhat assured, and a little abashed at my over-protective display, I thought back with a smile to ET, which we’d just watched with Nana (Eric’s mom) as our family movie on Saturday. Do you remember the scene where mom tells five year old Drew Barrymore that she’s just off to pick up big brother, and to be a good girl until she returns home?! Yep, five year olds left solo at home, the apparent norm in good ol’ 1982. I suppose today some still might call it free-range parenting, rather than parental naughtiness. Now I’m a free-range kinda girl when it comes to eggs…just not parenting. That said, I often wonder how much more damage we’re doing to our children by not allowing them the freedom and exploratory rights most of us enjoyed as children. House arrest doesn’t bode well either. At six years old, my husband had a house key hung around his neck and rode miles and miles to school on his bike, crossing a major road. After school, the latch-key-kid that he was, he’d ride home, see to homework and wait for mom’s arrival back from work. I believe it’s thanks to this childhood independence that he’s now such an innovative, independent, free-spirited and responsible guy. Our Alex, on the other hand, still needs mummy’s help mopping up his face after any given meal. There was a series of programs on BBC over the New Year called ‘Back in Time for the Weekend.’ A thoroughly modern, technology-obsessed family took a social experiment by living in each decade from the 1940’s to ten or so years into the future. Their house was transformed with the decade to resemble a typical home of that era. They dressed as they would have and lived in a way consistent with historical records of that given period. With the help of two enthusiastic social historians, delivering food boxes to prepare and incoming gadgets popular in the day, it proved to be a wholly enlightening and entertaining series. I was riveted by it. Especially as the large majority of children in the seventies and eighties, around the age of eight, would cycle down to the local park and play with pals until sundown or a wail from a parent. Perfectly normal. I’d be bordering on negligent, and perhaps risking lawful bother, if I serenely packed my young children off to our local park today and subsequent mishaps followed. As I see it, we’re living in a fear-based society. Thanks to the media relentlessly pushing into our screens and minds, we are consistently reminded of all the horrors that can very easily befall our innocent wee cycling babes. We’re scared. Many of us cling to our children to keep them safe. And there are noble reasons behind our actions. My neighbor and I exchanged family news after she offered up her time to play yogi guinea pig to me yesterday evening. We got chatting about this very subject, and she raised a valid point. She surmised that it’s not really to do with age, it’s to do with how much maturity and societal awareness your child possesses when trying to decipher how much freedom to grant them. Kids unfurl at different times. My own children are a classic example, Sophie always having been the more socially attuned than Alex. As with so much of parenting, our intuitive knowing is our greatest tool. We know. The cultural tide can sweep us away with how to parent but our children are all individual gifts, and we as parents know best how to unwrap the potential in our wee joy- bundles. I’m not sure about you, but our kids give us very loud clues along the way too! “Mum, I can do it, really,” is often a response I get from my old-soul Soph. And she can, and I believe it. But I have to quell that little fear-monster on my shoulder before I can really hear her. Although I don’t think I’ll ever consider myself a free-range parent, I will try to grace my children with more responsibility. If I don’t, perhaps we’ll never get to enjoy a peaceful retirement! Eric came home, righteous and puff-chested, (he’s not a helicopter parent) spouting a fact that now, more than ever, significant numbers of American ‘children’ are living at home with their parents well into adulthood. The economic situation I suggested? Nope, he replied, because of helicopter parenting: Kids can’t even work a washing machine solo, how are they going to live by themselves? Food for thought, hmmm?! As always I’d love to know your view. No doubt they’ll be lots to share by then. Thank you for your readership, it means so very much. See you back here soon! I wish you a sunny and bright few weeks! 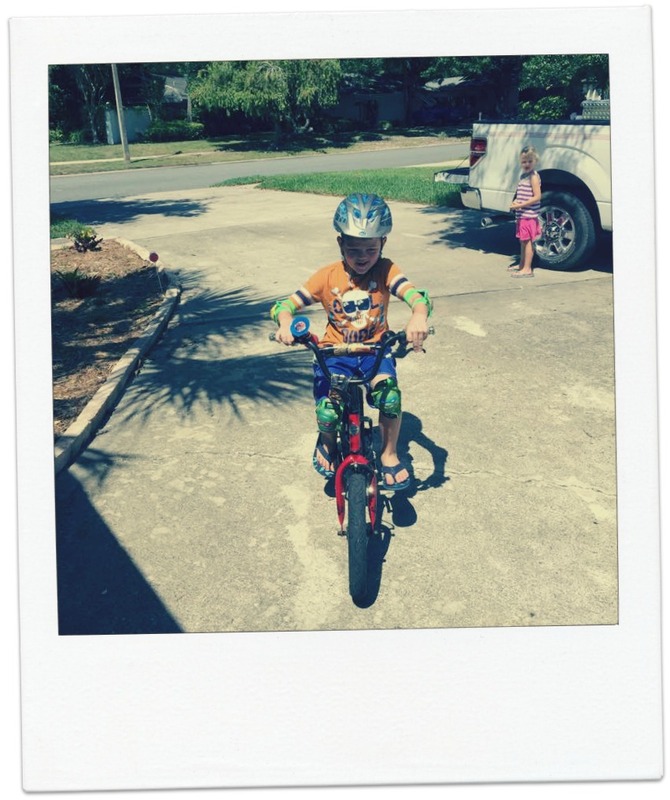 This entry was posted in Domesticity, Exercise, Other Lovely Things, Parenting. England; I Can’t Stay Away!